Scientists at IBM Research in Zurich have developed artificial neurons that emulate how neurons spike (fire). The goal is to create energy-efficient, high-speed, ultra-dense integrated neuromorphic (brain-like) technologies for applications in cognitive computing, such as unsupervised learning for detecting and analyzing patterns. The results of this research appeared today (Aug. 3) as a cover story in the journal Nature Nanotechnology. 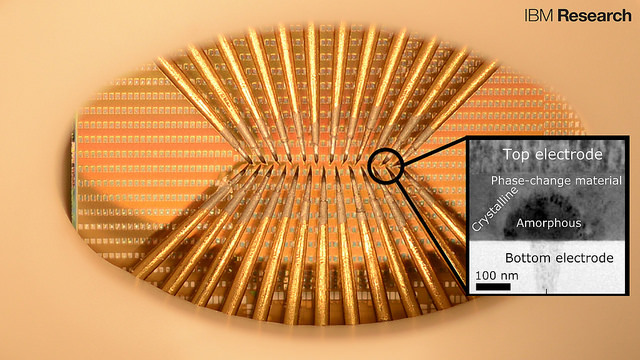 IBM’s new neuron-like spiking mechanism is based on a recent IBM breakthrough in phase-change materials. Phase-change materials are used for storing and processing digital data in re-writable Blu-ray discs, for example. The new phase-change materials developed by IBM recently are used instead for storing and processing analog data — like the synapses and neurons in our biological brains. The new phase-change materials also overcome problems in conventional computing, where there’s a separate memory and logic unit, slowing down computation. These functions are combined in the new artificial neurons, just as they are in a biological neuron. In addition, previous attempts to build artificial neurons are built using CMOS-based circuits, the standard transistor technology we have in our computers. The new phase-change technology can reproduce similar functionality at reduced power consumption. The artificial neurons are also superior in functioning at nanometer-length-scale dimensions and feature native stochasticity (based on random variables, simulating neurons). “The relatively complex computational tasks, such as Bayesian inference, that stochastic neuronal populations can perform with collocated processing and storage render them attractive as a possible alternative to von-Neumann-based algorithms in future cognitive computers,” the IBM scientists state in the paper. IBM scientists have organized hundreds of these artificial neurons into populations and used them to represent fast and complex signals. These artificial neurons have been shown to sustain billions of switching cycles, which would correspond to multiple years of operation at an update frequency of 100 Hz. The energy required for each neuron update was less than five picojoule and the average power less than 120 microwatts — for comparison, 60 million microwatts power a 60 watt lightbulb. Artificial neuromorphic systems based on populations of spiking neurons are an indispensable tool in understanding the human brain and in constructing neuromimetic computational systems. 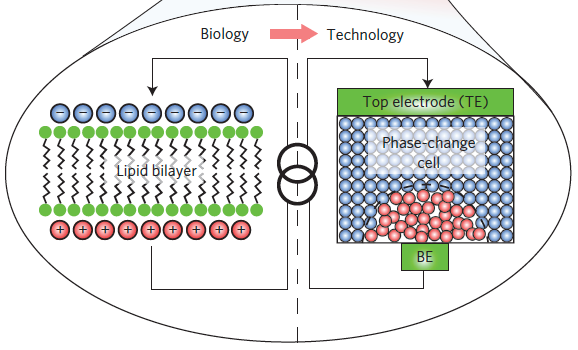 To reach areal and power efficiencies comparable to those seen in biological systems, electroionics-based and phase-change-based memristive devices have been explored as nanoscale counterparts of synapses. However, progress on scalable realizations of neurons has so far been limited. Here, we show that chalcogenide-based phase-change materials can be used to create an artificial neuron in which the membrane potential is represented by the phase configuration of the nanoscale phase-change device. 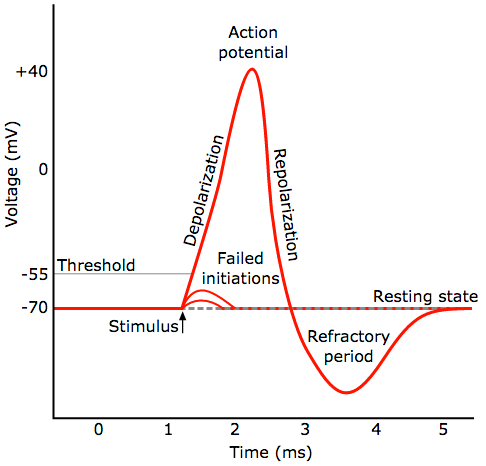 By exploiting the physics of reversible amorphous-to-crystal phase transitions, we show that the temporal integration of postsynaptic potentials can be achieved on a nanosecond timescale. Moreover, we show that this is inherently stochastic because of the melt-quench-induced reconfiguration of the atomic structure occurring when the neuron is reset. We demonstrate the use of these phase-change neurons, and their populations, in the detection of temporal correlations in parallel data streams and in sub-Nyquist representation of high-bandwidth signals.